ABIDJAN, Côte d’Ivoire — This review of the cocoa market situation reports on the prices of the nearby futures contracts listed on ICE Europe (London) and U.S. (New York) during the month of December 2018. It aims to highlight key insights on expected market developments and the effect of the exchange rates on cocoa prices. Chart I shows the development of the futures prices on the London and New York markets at the London closing time. Both prices are expressed in US dollars. The London market is pricing at par African origins, whereas the New York market is pricing at par Southeast Asian origins. Hence, under normal market conditions, the London prices should be higher than the New York ones. Any departure from this price configuration provides indication on the relative, expected availability of cocoa beans at the delivery points, designated by the exchange, at contract expiration. Chart II depicts the change in the ICCO daily price index and the US dollar index in December. By comparing these two developments, one can extricate the impact of the US dollar exchange rate on the development of the US dollar-denominated ICCO daily price index. The first position of the cocoa contract generally perked up during December on both markets. Indeed, prices firmed by 13% in London and by 10% in New York. The factors underlying this bullish stance include weather patterns and origins grindings. Although prices increased during December, they fell over the first seven trading days as shown in Chart I. This was an implication of reports that massive supplies of cocoa beans from West Africa were recorded, especially from Côte d’Ivoire. Thereby, the front-month cocoa contract prices reached their lowest level of the month settling at US$1,879/tonne and US$2,060/tonne in London and New York respectively. In addition, compared to their values recorded during the first trading day of the month, the nearby contract prices regressed by 7% from US$2,020/tonne in London and by 6% from US$2,200/tonne in New York on 11 December 2018. However, this bearish stance was short-lived and thereafter, an increase in prices was observed on both markets based on expectations of a slowdown in cumulative arrivals of cocoa in Ivorian ports in conjunction with news indicating that dry winds and below-average rainfall occurred in most of Côte d’Ivoire main cocoa growing regions. Furthermore, the Association of Coffee and Cocoa Exporters of Côte d’Ivoire (GEPEX) released grindings data showing that, since the start of the 2018/19 cocoa season, processors had grinded 84,000 tonnes of cocoa beans by end November. This represents an expansion of 10% in grinding activities in Côte d’Ivoire compared to the same period last year. 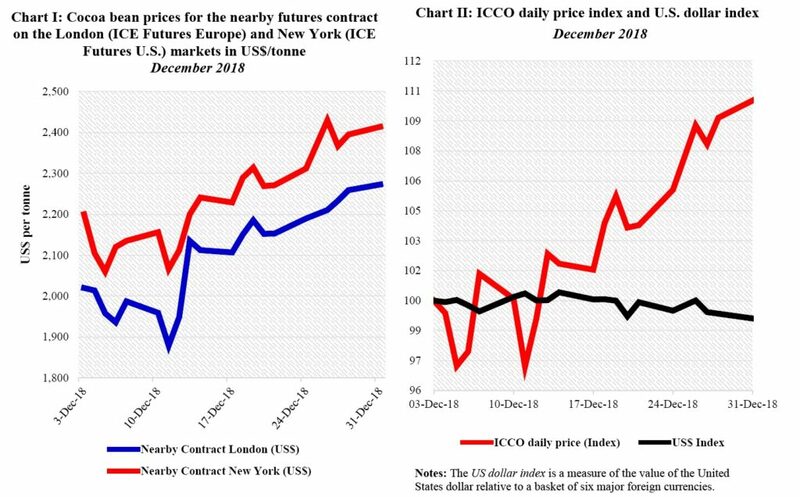 Taking into account the aforementioned bullish factors, the front-month contract prices strengthened by 21% in London and by 17% in New York by the end of the month in contrast with their level reached on December 11. The unexpected market configuration where cocoa futures in New York priced with a premium over London occurred again during the month being reviewed (Chart I). Indeed, news that unfermented cocoa beans were supplied from Asia to the United States coupled with the itch grass prevention measures that affected shipments from Ecuador to the United States maintained cocoa prices higher on the New York market compared to London. The US dollar index depreciated by nearly 1% from its value displayed at the beginning of December while the ICCO daily price index earned 10% from its start of the month value (Chart II). The US dollar contributed nearly 1% to the enhancement of the cocoa futures contract prices whereas the impact of other factors including market fundamentals stood at 9%. At the end of 2018, the front-month cocoa contract prices recorded a strong improvement over the previous year increasing by 28% on both the London and New York markets as seen in Table 1. The US denominated ICCO daily price registered an annual growth of 25% to settle at US$2,365/tonne compared to the previous year while the SDR-denominated price expanded by 28%, settling at US$1,701/tonne over the same period. The global cocoa market seems to be bracing itself for a high production during the 2018/19 season as top producers are likely to maintain their record crop levels that led the market to experience a surplus during the last two previous seasons. 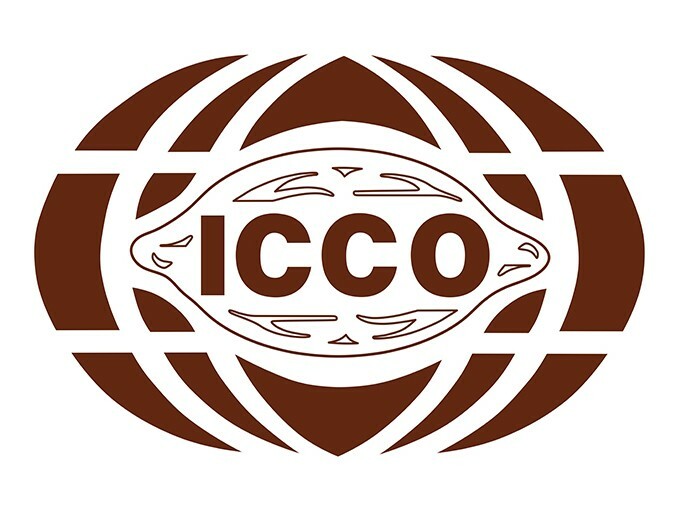 Indeed, as at 13 January 2019, news indicated that, cumulative cocoa arrivals recorded at ports in Côte d’Ivoire had reached 1.195 million tonnes, up by 12% from 1.071 million tonnes seen in the same period last season. During the week of 7-13 January 2019, a total of 60,000 tonnes of cocoa beans were delivered in Ivorian ports against 72,000 delivered in the country for the same week last season. On the demand side, figures published at the time of writing by the European Cocoa Association (ECA), the National Confectioners’ Association (NCA) and the Cocoa Association of Asia (CAA) showed a bullish trend in grindings for the fourth quarter of 2018. Indeed, the ECA posted data indicating a 1.6% year-on-year increase to 359,103 tonnes while the NCA had a 1.25% increase to 117,526 tonnes. In addition, data released by the CAA showed a 6.32% expansion year-on-year to 208,900 tonnes.